There are books and there are books. There are books which you read, dreamy eyed, amid slothful slumbers, floating between various stages spread between consciousness and unconsciousness. But then, there are books which hit you hard out of your stupor, drags you out of a protective Utopian shell, churns your heart and makes you want to cry out the truth, you are suddenly exposed to. This Novel by the great Russian is one such book. Having read it and wept over the pages, it makes you want to wander around like Nietzsche's Madman with lantern in his hands. It exposes one with the sadness in this world which embraces the Earth in its grey dullness extending across the continuum. Right when you are so dispirited to jump off the cliff, you find an audacious and stubborn dawn struggling to break free at the farthest end of the gloomy dark sky. This gloom, the dark and the sudden light at the end is wherein lies the beauty of the book. 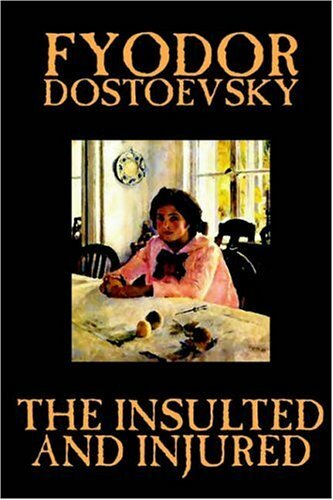 Typical of Dostoevsky, the story does not play with characters to put forward a high flying banner message. It creates living, breathing people and delves deep into the hearts of the characters and looks at their trials and tribulation.The message which comes out is a natural derivative and incidental. The characters are developed with love and patience and they grow into the story. "All my happiness was ruined from that moment, and my life was broken in half. I felt that poignantly..My thoughts we num; my legs were giving way beneath me. And that is the story of my happiness." Anyone who has loved and lost can identify with the moment when life splits in to two defined epochs of before and after kind of situations, colored in strong contrasts and how masterly the author writes it. Vanya gets them together, and lost, defeated reaches his home. In such moments of poignant defeat the dimensions of the world around us changes, it either expands with such rapidity that we gasp for breath or it shrinks so quickly that there is no place left for us to stand in sanity. Ivan says, "As it got darker my room seemed to grow larger and larger, as though the walls were retreating." Nikolai breaks down with what he looks as an act of thorough betrayal by his daughter. This is the saddest part of love which this novel writes about and yet the most profound- the love for the child. He struggles with himself to conquer the stubborn feeling of love which survives and even at times overpower the anger, betrayal and defeat which his loving daughter brought on him. To describe love between man and woman as lovers could be easier, but the describe love between a father and his child, in the middle of anger, defeat and a sense of loss takes rare delicacy of pen. Any father's heart would melt away when he reads how helpless Nikolai is when he wants to curse his daughter but is unable to bring himself up to the required hardness of heart to be able to do so. Dostoevsky writes here,"In solitude, unseen by all, he had gazed at the face of his adored child with infinite love, had gazed and could not gaze enough;..he had to shut himself from everyone to talk to his precious Natasha, imagining her replies and answering them himself; and at night with agonizing grief, with suppressed sobs, he had caressed and kissed the dear image, and instead of curses involved forgiveness and blessings on her whom he would not see and cursed before others." - which father's heart would not wring and bleed reading this? The sadness, the grief and profound love can soften the hardest of the heart. Natasha remembers how her father loved her as a little girl; a grown-up child but is helpless in the face of the love of the prince which she opted for and laments that I should be a woman..It's never entered his head...even if he (Nikolai) did forgive me he'd meet quite a different person now. As Vanya predicted and forewarned Natasha, the prince leaves her. He falls for mechanization of his father and is victim of his own inadequacy as he laments"she (Natasha) loves me too much, so that it's all out of proportion, and I suffer for it, and she too". Soft of resolve and unsteady of mind, and meets up with Katerina with whom he eventually marries. A parallel story runs of an old man, Smith, who dies in a cafe. Vanya, coincidentally is there at the time when Smith dies, together with his dog, Azorka. He takes up Smith's lodging, and finds a visitor, an impoverished, little girl of fourteen, Nellie. The girl is rescued from her distressing circumstances by Vanya. She stays with him, but is marred by several factors like her distrust of people, her past, her ill-health (she is epileptic) and her own feelings for Vanya, which she fails to understand well. At the advise of Natasha's mother, Vanya advises Nellie to join Nikolai household, who refuses as she hates the fact that Nikolai had abandoned his daughter for false pride. She then shares with Vanya, that her mother, was abandoned by her grandfather on account of her marriage which Smith did not approve of. The story painfully sad at the first time told to Vanya, breaks all bounds of grief, as if a there was tears raining from the skies, when she narrates how Smith ran with his grand-daughter when he learnt that his daughter, abandoned by him, was dying and could reach her only to find her dead. She tells that Azorka was the dog, Smith gifted to his daughter, and tells Nikolai, "When Mother left, she left Azorka behind. And that's why he was so fond of Azorka. He didn't forgive mother, but when the dog died, he died too." This story moves Nikolai who forgives Natasha, abandoned by then by the immature, young prince, and brings her back home. Nellie, in the middle of epileptic fits surrenders to death, but with hope as she witnesses her beloved Vanya finding love in Natasha. It is a simple tale, which touches the reader on account of sheer honesty and force of emotions. When you close the book, having finished it, you smile in tears. I did, as I kissed my five year old daughter, who was fast asleep by then. This book transcends time, nationality and gender. It is one such book which one reviews as a tribute. These are the books when not read are not a loss for the book or the reader, but a loss for the reader who went to the bookshelf and did not pick this book up. Must read for all readers of literature, writers and fathers and daughters. Lovely, Saket. It is such wonderful thoughts that make my day. Thanks. Thanks ggpamidi, for the visit and liking the post.